On-board database application for Android is now available on Google Play. 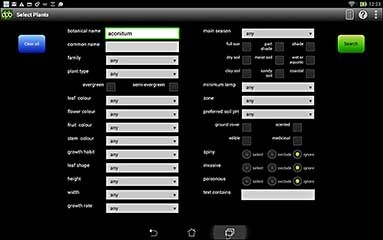 For smartphones and tablets we offer Plant Base for Android with the same basic capability as the Windows and Mac desktop editions. 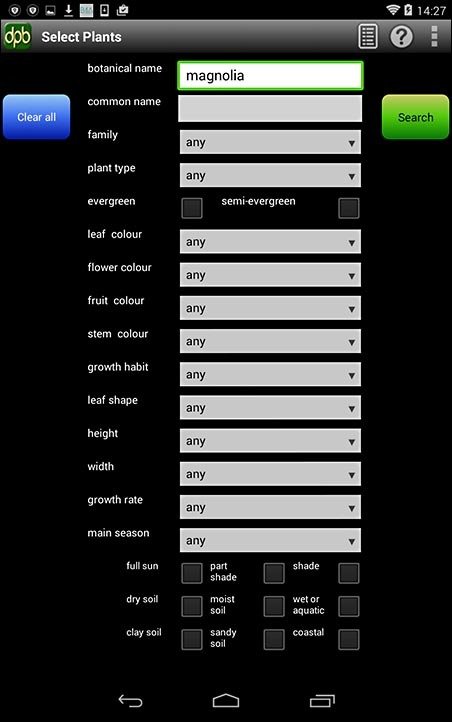 It uses exactly the same database to offer the same plant information. Designed for usability on mobile devices, this edition looks and works a little differently from the desktop programs. 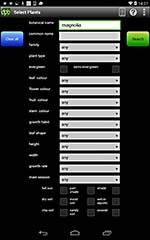 However, the main functions are the same - search and view plants, add or modify records or pictures and manage user-created plant lists. The database is the same for all editions and the files are completely interchangeable between all platforms - Android, PC and Mac. They can be simply copied between systems without requiring any kind of conversion. 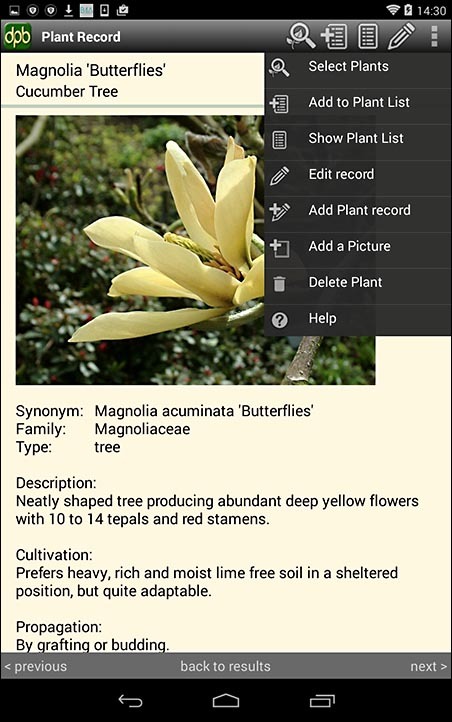 This full edition of Plant Base for Android is a completely "on-device" application and does not need an active internet connection for normal use - you can access the plant information anywhere and at any time. The core functions, with the capacity to handle the full size database, make this quite a large application. So compared to the desktop programs certain features have been omitted or simplified. Care has been taken to minimise system overheads and make the app simple and quick to use. Picture Library 3, which links to external image files, is not used. We feel this is less useful on mobile devices, but plan to add it at a future version. If the database file exists then it will be recognised by the app but no data accessed (for consistency with desktop files). Maintenance functions such as record extract and import are not included. We are not intending to provide these complex and heavyweight operations within the main app. However, a separate data support app offers three important functions - database download, data import and compact. These file operations can also be performed via the desktop editions. Printing, report creation and slide-show functions are not included. It is unlikely they will be part of the mobile app. 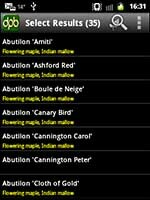 Plant List records can record location information from the device's GPS. This is controlled by a simple button which enables the GPS. Accuracy depends on the capability of the device. Location coordinates are recorded to 6 decimal places. Plant Pictures can be captured and recorded directly from the built-in camera of the device. The Picture record edit/add function includes a crop facility, rotate and image resize. These are often needed when using the in-device camera capture. 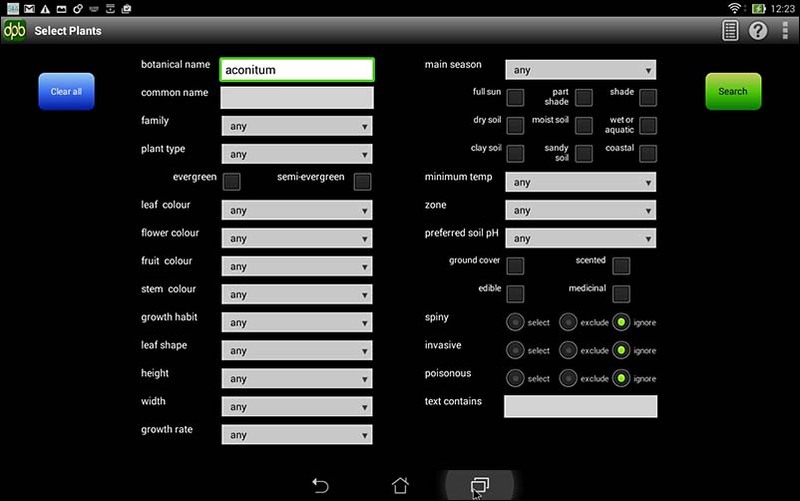 Plant Base for Android is available from the Google Play App Store, at a price based on half the cost of the desktop licence. As a distinct product, it is not included in the standard desktop Plant Base licence. 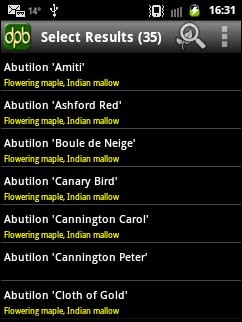 This Android application replaces a much older Mobile edition of Plant Base for MS Windows Mobile 5 and 6. Very few of these PPC/PDA devices are still in use and it is no longer actively supported. All our work with Android uses the Basic4Android development system from Anywhere Software. This is the same company that created Basic4PPC - as used by us some years ago to write the Windows Mobile edition of Plant Base. Since its release in December 2010 Basic4Android has become established as one of the most efficient programming languages to generate native mobile applications.